Vicki’s bunad comes from Nordmøre which is an area that encompasses Kristiansund, Kvernes, Tingvoll, Sunndal, Stangvik, Surnadal, Aure, and Edøy, Norway. The skirt and vest, or bodice, are attached. The skirt is black wool or navy blue, with tight, deep shirring at the waistline and has a wide band of red wool sewn to the underside of the skirt at the hemline. The linen blouse has a floral design of white embroidery on the cuffs and collar and yokes of the shoulders, with white needlework extending down the front on each side of the blouse opening. The bodice is also made of wool, with a double bird and floral design woven into the fabric. This fabric is bright red, but also comes in a dusty rose as well. The other option for the bodice is a navy blue and blue-green wool brocade woven with a rose design. All the bodices have a single row of silver or gold braid around the neckline, with two rows extending down the front on either side of the bodice opening. The apron for Vicki’s bunad is a bright red and green wool plaid on a black background, but it can also be made of a plaid in more muted tones of dusty rose, blue-green, and light brown on a navy blue background. 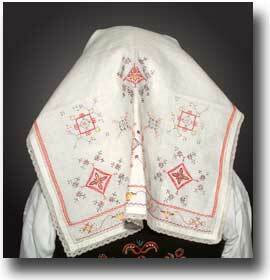 A white apron with a band of white needlework near the bottom can also be worn. A blue or black wool belt covered with inch and a half silver squares bearing a triple deity design with two diamond or donut shaped pieces of silver suspended from each square is attached over the apron. These costumes, belonging to Ken and Carole, come from the district Sunnmøre, which is on the west coast of Norway and goes deep into the magnificent fjord country. One of Norway's most famous fjords, Geiranger Fjord, lies in this district. Ålesund, Norway's most important fishing port, is the chief city of Sunnmøre. The area is characterized by islands on the coastal side, and by steep mountains dropping into the fjords inland. Many small farms cling to the mountainsides. These folk still enjoy wearing their costumes for festive occasions. Carole purchased the bunad from a Norwegian lady who no longer used it, and estimates the costume is at least 50 years old. 1. Bodice & Skirt--The high cut, sleeveless bodice is sewn to the flat-pleated skirt, both in the typical austere black wool of Western Norway. The bodice is embroidered with multi-colored floral and heart motives front and back and is piped with red wool. 2. Apron --The apron is matching black wool and is decorated in multi-colored embroidery with garlands winding along its edges and heart and flower designs scattered over the front and across back waistband. 3. Headpiece--A white linen scarf is worn, with multi-colored embroidery for unmarried women and black embroidery for married. It is tied at the n﻿ape of neck and a black silk band is wound over the front edge of scarf and around head and tied on top in a bow. Other parts of the costume include a white cotton, long full-sleeved blouse with white embroidery on collar, shoulders and cuffs and black stockings for married women and red for unmarried. 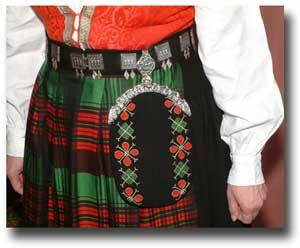 Ken is wearing the bunad from Sunnmøre, Norway. Ken’s parents were born in Ramstaddal, Sykkylven, Norway. His pants are black wool, as are his vest and jacket, and they all sport pewter buttons. To complete this warm suit are hand knit wool sox. The whole outfit was made in Norway for Ken 35 years ago. 1. Jacket -- The waist length jacket is black wool with a row of seven decorative pewter buttons down either side of front. 2. Vest -- The vest is also the characteristic black wool fastened down the front by seven pewter buttons. 3. Trousers--The trousers of black wool are knee length, closed at the knee with pewter buttons. 4. Jewelry--A silver pin is worn at the neck with the quivering gold-dipped discs hanging from it. Other parts of the costume include black and white geometrical patterned hand-knit wool stockings, a heavy white cotton shirt and black bunad shoes with pewter buckles. Red braid ties are wound around legs at the top of each stocking.